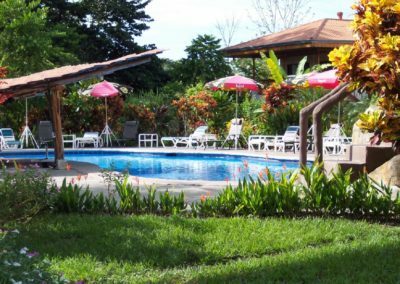 This fishing resort is situated on 44 acres of manicured tropical gardens with 28 air-conditioned rooms in Puerto Jimenez on the South Pacific Coast. Sport fishing in Costa Rica is world-class! Experience catch and release Pacific Ocean fishing for Sailfish, Striped Blue and Black Marlin, Dorado, Tuna and Wahoo fish. Inshore sport fishing on the Golfo Dulce (Sweet Gulf) for Roosterfish, Cubera Snapper,Jack Crevalle, Bluefin Trevally, Sierra Mackerel, Tripletail and Grouper is excellent throughout the year. We provide a variety of a fishing options such as-live bait, trolling, casting and fly-fishing. We also offer guided kayak fishing and shore fishing excursions. World class bill fishing for Sailfish, Blue, Black and Striped Marlin starts just outside the mouth of the Golfo Dulce, about thirty minutes from our 880 foot pier. The Pacific Sailfish can be caught all year and, during the winter months, it is common to raise 10 to 15 in a day. We practice catch-and-release fishing, using safer circle hooks. Our fishing director and English-speaking captains will work with you to accommodate your style and pace. In addition to the blue water, our smooth water Golfo Dulce (Sweet Gulf) provides anglers exciting inshore action. Home to Roosterfish, Bluefin Trevally, Jacks, Grouper, Cubera & Colorado Snapper and others, you will find plenty of different fishing spots to try in this 30-mile long saltwater gulf. Day 1 Arrive into San Jose. You will need to go through immigration, claim your bags and pass through customs. You will exit the terminal where all the transportation people await tourists; a representative of Crocodile Bay Lodge will meet you. You will then be transferred to the Hotel Melia Carari(10 minutes away). Remainder of evening at leisure. Day 2 You will be picked up at the hotel at 7:00 am for your 8:30 am flight on Travelair to The Lodge. 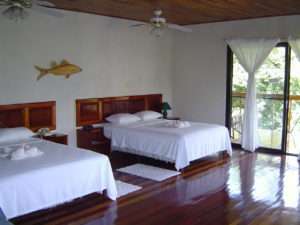 Upon arrival you will get situated in your room and begin your groups first full day relaxation or eco tour. Alcoholic beverages at the resort, transfer fees, domestic airline overweight seat and baggage, international airfare, meals in San Jose, Costa Rican sales tax of 13% on room rates, airport departure tax, change fees, gratuities.